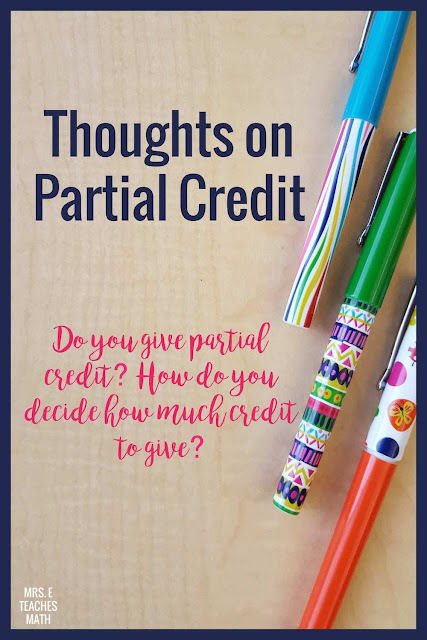 I’ve been thinking about partial credit a lot this year. I want grades to accurately describe my student’s level of knowledge, but I also don’t want them to feel discouraged. Remember, I only have honors students. All of my students would make an A in an on-level course, no problem. My goal is to challenge them, without making them want to drop the course in order to get the “easy A”. Side Note: At my school students can choose to move from an Honors/AP course into an on-level course at any point during the school year. We are on a 5.0 scale and they get to bring their GPA points with them. For my less motivated Honors students, it can be a challenge to keep them in Honors, where they need to be. 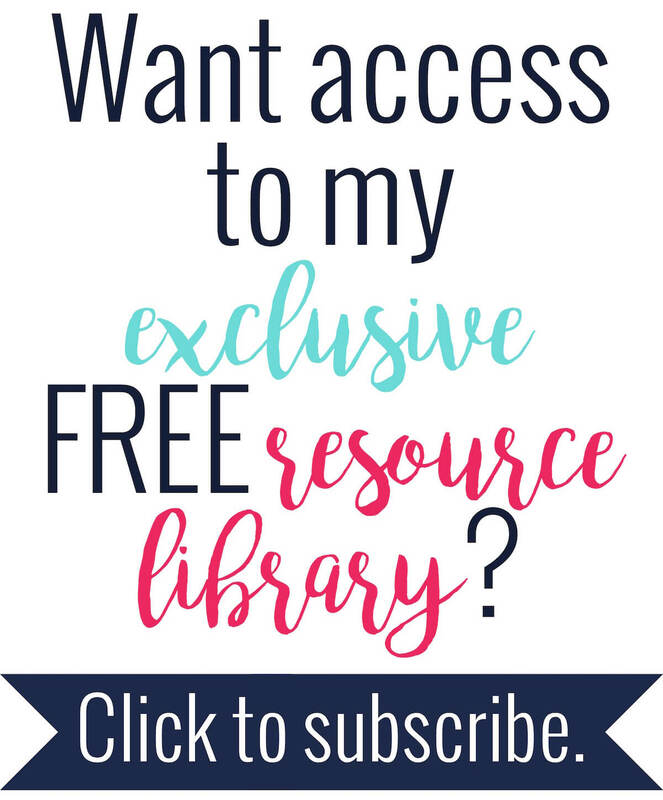 • It keeps my students from getting too discouraged (especially my freshmen!). My tests can be difficult. • It helps me differentiate from students that understand the concept, but make computation errors vs. students that have no idea what they’re doing. Computation errors are very different mistakes than, say, forgetting exponent properties. Those types of errors should be treated differently. • It encourages my students to show their work neatly. My freshmen really struggle with this. So many of them struggle with writing down their work, even though they are honors-level students. • Getting an answer is just as important as the process. Our AP Calculus teacher uses the following example: If you were going in for open heart surgery, would you want your surgeon to get 90% of your surgery right? He got most of it, he just made a few “little” mistakes. While I understand that high school isn’t “the real world”, I totally understand this example. We need to stress the importance of the correct process AND the correct answer. • Grading takes much longer. • It can give students (and parents, and future teachers) a false representation of their skills. Students in my course should make an A because they understand the concepts and can solve problems. Students should not make an A because they can get 90% of any problem correct. Currently, I give partial credit on tests and quizzes. However, I make the key and decide how partial credit will be awarded before I give the students the assessment. There are usually questions on every test or quiz that do not receive partial credit. When I’m grading, I grade one page of each test at a time. That way, I’m concentrating on grading one or two problems at a time. I grade all tests without looking at the student’s name. I feel this is the only way I can be fair. This is working for me, but I wonder if there is a better way. I know some people have moved to SBG (standards based grading), and this could be the answer for me, eventually. However, I'm just not there yet. Keep in mind, these are all Honors-level students. Would your answers be different if this were an on-level or remedial class? This student has the right idea, but doesn’t remember the correct vocabulary. Would you give partial credit for “having the right idea”? Would you give no credit? Would you give full credit and write a comment? 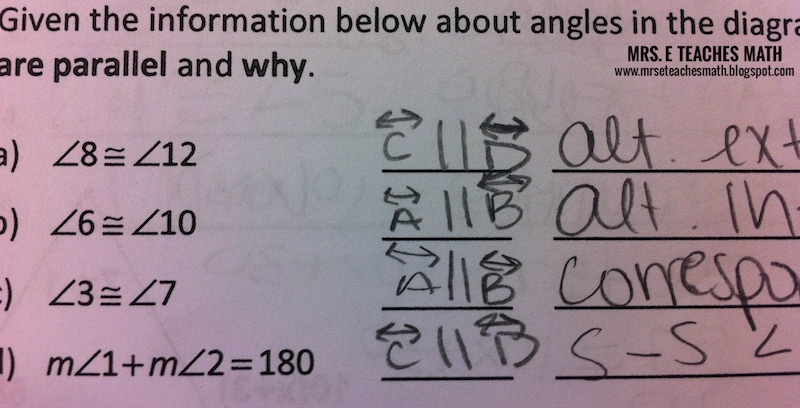 This student understands the concept and has the correct answer. However, they did not use the correct notation. Do they get full credit? Would you take off points for incorrect notation? Would you only write a note? This student uses the correct vocabulary, but also includes something that’s not quite right. Would you take off points? Would you give full credit and write a comment? The big push in our district is that grades should reflect mastery of our TEKS (standards). Several of the new processing standards address communicating mathematically and one in particular addresses precise mathematical language. So that raises some brand new arguments. When I correct my students' vocabulary, they are always saying "you knew what I meant" but it wasn't mathematically precise, so while I might have known what they meant, would someone else have known what they meant. It's almost like we need two scores now - one for you have the concept and one for you can communicate the ideas. But the two things are intertwined and very difficult to separate. We, as teachers, need to start training our students (especially pre-AP students) to communicate more precisely. I totally understand the "you knew what I meant" comment that your students have. I've had that conversation with my students before. It makes it difficult when I'm grading (especially if I recognize their handwriting! ), because I do know what they mean, but that's not the point. This past year I actually made my geometry students write out the theorem instead of writing theorem names, to encourage preciseness. It helped a lot, but didn't totally solve the problem. I personally do a lot of partial credit. If they drop a negative or multiply incorrectly, I don't think they should lose all the points. If the vocabulary is something you have stressed in class, then they should have the right words for their answers. I might again give some points for knowing the idea although they didn't come up with the exact words (in the reciprocal example). In the Geometry example, they are learning correct notation in that class especially and I would take some points off. You have been teaching and showing them what to do all along they need to feel the pain of losing some points. Especially the students you are working with will tend to focus on any lost points in order to not make the same mistakes again. I go back and forth on taking off points if they have the correct answer but try to cover the possibilities by putting a second answer. You know your students and can decide what is best for them. It may depend on how you have emphasized information and what you feel is important. I don't have a pre-made rubric for grading tests but I do group them by problems they missed so I can take the same number of points off for the same mistakes. In other words, I correct everyone's problem number 1, marking off points then move to number 2. Thanks for your blog. I really appreciate your reasons stated for partial credit. It has always been something I have questioned as I grade student's work. It is good to know there are others debating the same questions! I really enjoy your activities and ideas! I teach An AP Stat class and I work my way through your 3 suggestions. When a concept is newly introduced I correct it and comment on how it should be written. I warn my students that on the next assessment when it spirals back around it will cost them points. I give partial credit then. To ward the end of the year as we are getting close to the AP test, I start getting really picky about details, notation etc... Since they have been doing it all year partial credit is harder to earn. Thanks again for sharing your thoughts and ideas! As I saw your samples, it reminded me of tests I used to give. Over the past few years I have shifted the format of my exams and I feel that some of your dilemma may be resolved if your reformatted your tests in such a way that a student has to use their knowledge to solve a "task" and explain or justify their thinking in their own complete sentences instead of filling in the blanks. Also, instead of grading on a correct or incorrect point structure, I have shifted to grading on a rubric. The rubric I created is on a scale from 4 to 0 and includes categories such as correct values which can be given credit for various levels of accuracy, variables which includes using, creating, or solving with appropriate equations, inequalities, or formulas, and a few others (depending on the test). I also give my students "sample" work and have them practice grading so they can learn the expectations I have for precision and accuracy. Beth, I totally agree. I do tend to give a lot of partial credit, but toward the very end of the year I give a little less. If I do grade something as "all or nothing" type points, then it's not worth very much. Erica, I do give assessments like that, but it's much less often than I probably should. Personally, I have so much trouble coming up with those types of questions for some material that I tend to fall back on old standards. That would be a professional development day that I would actually benefit from - effective assessment writing.